More than 3 decades of war affected Afghanistan society in many ways: millions have been killed or injured, millions displaced from their houses and villages and a large number of children were left with orphanages as their only shelter. Even now, military conflict, poverty and social injustice affect the whole country. A large number of schools are still closed, and the majority of the Afghan population have no access to health facilities. Studies on adults reported a high percentage of mental illnesses among adults (Cardozo, Bilukha, & Crawford, 2004), but no proper study has been carried on children and adolescents. The only such investigation was an unpublished study by United Nations International Children’s Emergency Fund (UNICEF) in 1997. In that study, 300 children in Kabul were interviewed. Around 90% of them thought that they were going to die in the war, and around 80% were said that they were sad, despairing and were not able to cope with their life (Van de Put, 2002). It is widely believed that the prevalence of post-traumatic stress disorder (PTSD) is high in Afghanistan; however, there is a shortage of reliable data to confirm this. It is known that a large of section of society including children has either witnessed, experienced or repeatedly heard of traumatic events. In an interview of 100 disabled and 669 able-bodied people aged over 15 years, nearly all of them reported that they had experienced at least four traumatizing events in the previous 10 years, and symptoms of PTSD were seen in 42% of them (Cardozo et al., 2004). In a study of children and adolescents between 11 and 16 years of age in Kabul, Mazar-e Sharif and Bamian, Panter-Brick et al. (2009)Panter-Brick, Eggerman, Gonzalez, and Safdar (2009) reported that two-thirds of these children had experienced at least one and 8.4% had experienced five traumatic events. Reduced autobiographical memory specificity (AMS) is a cognitive marker of PTSD and depression (refer to Williams et al., 2007). That is, individuals with depression and PTSD have significant difficulties remembering specific events from their lives and instead tend to provide over-general memories. There is now substantive evidence that reduced AMS has important implications for the functionality of everyday cognition, which has the potential to result in on-going negative social encounters, diminished positive social reinforcement, feelings of hopelessness and depressed mood (Raes, Williams, & Hermans, 2009). Difficulty in accessing specific information about the past also potentially interferes with the ability to update and re-script the trauma memory, processes known to be integral to PTSD recovery (Moradi, Abdi, Fathi-Ashtiani, Dalgleish, & Jobson, 2012). Given these associated difficulties, it is unsurprising that reduced AMS has been found to predict subsequent PTSD and depression at 6 months over and above what could be predicted from initial symptom severity (Kleim & Ehlers, 2008; Yeung, Dalgleish, Golden, & Schartau, 2006) and can be modified (Williams, Teasdale, Segal, & Soulsby, 2000). Therefore, clinical efforts to improve AMS should have positive clinical outcomes for patients with symptoms of PTSD and depression (Raes et al., 2009). Preliminary research has investigated whether a brief stand-alone training programme targeting AMS (memory specificity training: MEST) can improve AMS and depression. Raes et al. (2009) evaluated the feasibility of MEST, in a study that comprised four weekly 1-h group sessions with 10 depressed female inpatients, and its impact on the cognitive processes is believed to be critical to reduced AMS (Williams et al., 2007). They did not report MEST’s effects on symptom outcome. They found that, following MEST, AMS improved and that improvements in AMS were associated with diminishing rumination, cognitive avoidance and improved problem-solving. In a follow-up study, Neshat Doost et al. (2013) reported on the first randomized controlled trial (RCT) of MEST, investigating its impact on AMS and symptoms of depression. A distressed sample of bereaved Afghan adolescents was randomly assigned into a MEST or control group (which received no additional contact). 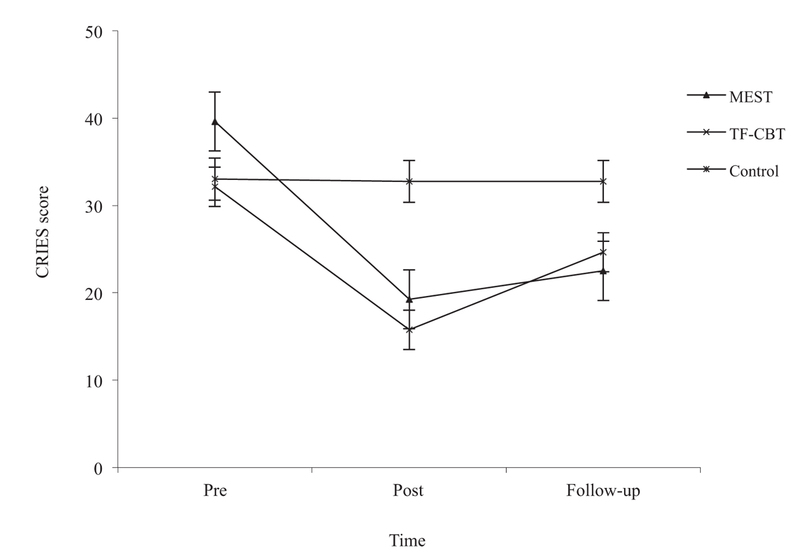 Depression was measured immediately post-intervention and at 2-month follow-up. MEST was successful in significantly enhancing AMS relative to no significant change in the control group. Although the groups did not differ in terms of depression at post-treatment, at 2-month follow-up, depressive symptoms for adolescents in the MEST group had been significantly reduced into the non-clinical range, with no change in the control group. Importantly, changes in AMS significantly brought about this MEST-related improvement. This first RCT suggests that MEST is an efficacious intervention that can result in diminution of symptoms of depression. Critically, MEST can be implemented by those with limited training and experience in challenging clinical contexts, making it a relatively low-intensity alternative to complex interventions such as cognitive behaviour therapy (CBT). Important questions remain to be addressed. As noted, reduced AMS is a core cognitive maker of PTSD, and the effects of MEST on PTSD symptomatology remain unassessed (Ahmadi, Kajbaf, & Neshat Doost, 2012). It is also important to explore the impact of MEST in comparison with other forms of helping people suffering from PTSD to estimate its relative efficacy. Consequently, the current study is a small-scale pilot RCT investigating whether MEST leads to any improvements in PTSD symptomatology, immediately following training and at 12-week follow-up when compared both with a no-treatment control group and with trauma-focused CBT (TF-CBT). Participants were bereaved, war-exposed, displaced male adolescents in Afghanistan who were experiencing significant current symptoms of PTSD. We selected this sample because pre-clinical work has shown that bereaved war-affected Afghan adolescents have reduced AMS (Neshat Doost et al., 2014). Moreover, the evidence indicates that, as a result of ongoing conflict in Afghanistan, young Afghani people are suffering from a broad spectrum of psychological problems including PTSD and depression (Panter-Brick, Goodman, Tol, & Eggerman, 2011). Furthermore, war-related loss of a parent increases adolescents’ risk of developing psychological disorders (Morina, von Lersner, & Prigerson, 2011). Hence, interventions that can improve mental health problems in this population are needed, especially as adolescence is a crucial developmental period in terms of the aetiology and long-term prognosis of psychological disorders (Kuyken & Dalgleish, 2011). Although the Afghan government policy has emphasized the need for mental health interventions, there is an acute shortage of qualified mental health practitioners and significant constraints on the current provision of health services (Panter-Brick et al., 2011). Therefore, cost-effective interventions such as MEST that are easy to deliver on the ground by practitioners with little training are imperative. Participants were recruited from a Kabul shelter for male adolescents. The participants were aged 12 to 18 years old. After taking permission and consent from the carers and the adolescents themselves, all adolescents (n = 70) were screened for symptoms of PTSD and depression. To be included in the RCT, participants had to score 30 or above on the Children’s Revised Impact of Event Scale (CRIES) (IES-R-13) and 27 or above on the Persian version of the Mood and Feeling Questionnaire (pMFQ). The CRIES is a measure of PTSD, and a cut-off score of 30 has been found to maximize sensitivity and specificity, minimize the rate of false negatives and correctly classify 75% to 83% of children (Perrin, Meiser-Stedman, & Smith, 2005). The MFQ is a well-established adolescent depression questionnaire. The cut-off of 27 was selected as research indicates that adolescents who score above this meet screening criteria for major depression disorder, including on the pMFQ (Neshat Doost, Nouri, Molavi, Kalantari, & Mehrabi, 2006). Based on the secriteria, 40 adolescents were recruited, all of whom had lost either one (father n = 22, mother n = 1) or both (n = 1) parents due to the war in Afghanistan. Sixteen participants were randomly allocated to another study on debriefing, and the remaining 24 took part in the present study. These 24 participants were randomly allocated to MEST (n = 8), TF-CBT (n = 8) or the control condition (n = 8). The pMFQ (Neshat Doost et al., 2006) is a 32-item questionnaire based on criteria for depression. It consists of a series of descriptive phrases regarding how the participant has been feeling or acting, and the adolescent rates whether the phrase was descriptive of them ‘most of the time’, ‘sometimes’ or ‘not at all’ in the previous 2 weeks. The reliability and validity of the Persian measure has been found to be good (Neshat Doost et al., 2006). In the current study, internal consistency was good (α = .82).The CRIES contains 13 items that measures the impact (re-living, avoidance and hyperarousal symptoms) of trauma. The trauma event was specified as war-related experiences, and items were in Persian. Individual items are rated according to the frequency of their occurrence during the previous week from 0 (none) to 5 (a lot). The IES-R-13 has been used in previous research with Afghans (Panter-Brick et al., 2011). In the current study, internal consistency was good (α = .78). The autobiographical memory task (AMT; Williams & Broadbent, 1986) is the gold-standard test of memory specificity, and the version presented here was identical to that prototypically employed in the existing research. The AMT has adequate psychometric properties (Griffith, Sumner, Debeer, Raes, & Hermans, 2012). In the present study, participants were presented with 18 Persian cue words consisting of positive (e.g. party, مهمانی،), negative (e.g. war, جنگ) and neutral (e.g. class, صنف) words. These words were selected based on a pilot study in which the positive and negative emotionality of several hundred Persian words were rated by 60 raters. Three psychologists then selected six positive, six negative and six neutral words with the highest emotionality ratings that were also balanced for frequency of use and length (Griffith et al., 2009). Before use in the current study, these words were tested. MEST was conducted by trained senior clinical psychologists, Hamid Taher Neshat Doost and Sayed Jafar Ahmadi. The training package consisted of five weekly 80-min group sessions in one of the classrooms. All words used in the training were different from the words used in the AMT. In this training programme, a word was shown to a participant, and he was asked to read that word aloud. After reading the word, the participant has 30 s to express the memory of a specific event that the word reminds him of. Also, the participant is told that the event in question must have taken place recently and lasted less than 1 day. Usually, participants can provide four types of responses to reading clue words: specific recall (e.g. ‘This year, at my birthday party, my dad and my mother gave me a computer’), extended recall (e.g. ‘My birthday celebrations last year lasted for 3 days’), categorical recall (e.g. ‘Everybody celebrated my birthday and was happy with me’) and ‘non-memory’. Extended recall and categorical recall both are forms of general recall. Session 1 included an explanation of the aims and outline of MEST. At the beginning of this session, the definition and importance of key terms, such as autobiographical memory and recall, and the three types of autobiographical memory (specific, extended and categorical) were explained. At the end of the session, participants were given 10 cue words (e.g. War, Death, Bag, Mother, …) and were instructed to write down specific, extended and categorical memories for each of the words during the next week as homework. Each participant was provided with a pen and notebook to use for summarizing sessions and for homework tasks. Session 2 commenced with a review of Session 1 and the homework. The group then was prompted to give positive cue words. These words were written on the whiteboard, and participants were asked to provide a specific memory for each of the cue words. If one of the participants recalled a non-specific memory, the type of the memory (i.e. categorical or extended) was clarified, and the participants were prompted to recall specific memories. At the end of the session, 10 positive cue words were given, and participants were asked to provide one specific memory for each of the words as homework. Sessions 3 and 4 were very similar to Session 2, as were the associated homework tasks. The only difference was the content of the cue words. The cue words were negative for Session 3 and neutral for Session 4. Session 5 was again similar to previous sessions. The distinction between different types of autobiographical memory recall was practiced with positive, negative and neutral cue words, and the difference between a memory and a non-memory was clarified. At all meetings, the word written on paper was shown to the participants. They should express their own memories according to the initial training. After relating those memories, others were asked to tell if this memory was specific or not. If the memory was not specific, the person was asked to correct it. At all meetings, the participants tried to express their specific memories as they were defined. The TF-CBT package was also a five-session group intervention conducted by the first author. It was based on general outlines for TF-CBT with children and adolescents. Session 1 provided psychoeducation about the impact of trauma and common reactions. At this meeting, the concept of trauma was explained. The participants were asked to mention some effects of traumatic experiences, and what they said was written on a flip chart. Session 2 focused on relaxation, stress-management skills and coping with emotions. At this session, after explaining about ways of coping and stress management, a relaxation exercise was carried out. Sessions 3 and 4 focused on cognitive coping and processing and included illustrating the relationships among thoughts, feelings and behaviours, identifying and modifying inaccurate or unhelpful thoughts about the trauma and in vivo mastery of traumatic reminders. Examples were given at these sessions, and participants were encouraged to discuss how their own feelings, thoughts and behaviours were interlinked. Session 5 provided a review of the intervention. Ethical approval was obtained from the University of Isfahan. Information sheets and consent forms were given to participants and their parents/guardians. Participants were tested individually by researchers blind to group status on three occasions: pretraining, post-training and 12-week follow-up. The pretraining assessment consisted of the MFQ and CRIES. Following this, we randomly allocated participants to the intervention groups or the control group (which had no additional contact). The intervention sessions took place in one of the rooms at the shelter. At post-training and at 12-week follow-up, the CRIES and MFQ were re-administered. [Figure 1] depicts participant flow throughout the duration of the study. Figure 1: Mean scores on the Child Revised Impact of Event Scale (IES-R-13) for each group at pre-intervention, post-intervention and follow-up. Error bars are +1 SEM CRIES = Children’s Revised Impact of Event Scale, MEST = memory specificity training, SEM = standard error of the mean, TF-CBT = Trauma-focused Cognitive Behaviour Therapy. To identify intervention effects at post-intervention and 12-week follow-up, we used one-way analyses of covariance (ANCOVAs) with pre-intervention scores as covariates. To identify within-group effects, paired t-tests (pretreatment versus post-treatment, pretreatment versus follow-up) were used. Clinical change was assessed using reliable change analyses. [Table 1] shows that the groups did not differ significantly on the baseline demographic or clinical characteristics. There were no dropouts, attesting to the feasibility of MEST in this clinical context. The groups differed significantly on the CRIES at post-intervention: F(2, 20) = 16.09, P < .001, ƞp2 = .62 [Table 1]. Follow-up analyses found that both MEST [F(1, 13) = 17.21, P = .001, ƞp2 = .57] and TF-CBT [F(1, 13) = 48.98, P < .0001, ƞp2 = .79] had significantly lower levels of PTSD symptoms than the control group. The MEST and TF-CBT groups did not differ significantly from each other: F < 1. Within-group analyses found that, although there was no significant change for the control group [t(7) = .40, P = .70, d = .04], the TF-CBT [t(7) = 6.69, P < .001, d = 2.53] and MEST [t(7) = 3.16, P = .02, d = 1.62] groups had significant reductions in PTSD symptoms. Compared with the control group, the controlled effect sizes1 for MEST [d = 2.37, 95% confidence interval (CI) = −2.08 to 6.95] and TF-CBT (d = 2.82, 95% CI = −1.63 to 7.22) were large. The post-intervention controlled effect size for MEST compared with TF-CBT (d = .40, 95% CI = −4.18 to 4.79) was moderate. Analyses of reliable change found that four participants (50%) in the MEST group and four participants (50%) in the TF-CBT group, but none of the control group, met the criterion for reliable change. We also looked at symptoms of depression on the MFQ. The groups were found to differ significantly post-intervention: F(2, 20) = 5.07, P = .02, ƞp2 = .34 [Table 1]. Follow-up analyses found that both MEST [F(1, 13) = 7.90, P = .02, ƞp2 = .38] and TF-CBT [F(1, 13) = 13.06, P < .01, ƞp2 = .50] had significantly lower levels of depression symptoms than the control group. The MEST and TF-CBT groups did not differ significantly from each other: F < 1. Within-group analyses found that, although there was no significant change for the control group [t(7) = .70, P = .51, d = .10], the TF-CBT [t(7) = 4.75, P < .01, d = 1.68] and MEST [t(7) = 3.29, P = .01, d = 1.32] groups had significant reductions in depression symptoms. The controlled effect size for MEST (d = 1.27, 95% CI = −4.68 to 5.85) and TF-CBT (d = 1.24, 95% CI = −4.71 to 6.50) were large. The post-intervention effect size for MEST compared with TF-CBT (d = .04, 95% CI = −4.54 to 5.31) was trivial. Reliable change analyses found that six participants (75%) in the MEST group and seven (87.5%) in the TF-CBT group, but none in the control group, met the criterion for reliable change. One-way ANCOVAs on 12-week follow-up data showed that the groups significantly differed on the CRIES: F(2, 20) = 7.43, P < .01, ƞp2 = .43 [Table 1]. Follow-up analyses found that both MEST [F(1, 13) = 12.36, P < .01, ƞp2 = .49] and TF-CBT [F(1, 13) = 9.97, P < .01, ƞp2 = .43] had significantly lower levels of PTSD symptoms at follow-up than the control group. The MEST and TF-CBT groups did not differ significantly from each other: F < 1. Paired t-tests showed that both MEST [t(7) = −2.84, P = .03, d = 1.49] and TF-CBT [t(7) = −3.05, P = .02, d = 1.29] had significantly lower levels of PTSD symptoms at follow-up compared with pre-intervention. There was no significant change for the control group: t(7) = .33, P = .75, d = .04. Reliable change analyses found that three participants (37.5%) in the MEST group, two participants (25%) in the TF-CBT group and none of the control group met the criterion for reliable change. One-way ANCOVAs on 12-week follow-up data showed that the groups did not differ significantly: F(2, 20) = 2.63, P = .10, ƞp2 = .21 [Table 1]. Within-group analysis found that neither the MEST [t(7) = 1.38, P = .21, d = .25] nor the TF-CBT [t(7) = 1.80, P = .12, d = .90] follow-up scores differed significantly from pre-intervention scores. The control group tended to have worse depression at follow-up compared with pre-intervention scores: t(7) = 2.21, P = .06, d = .62. Interestingly, reliable change analyses found that three participants (37.5%) of the MEST group, four participants (50%) of the TF-CBT group and none of the control group met the criterion for reliable change. No participants in the MEST group but 12.5% of the TF-CBT group and 50% of the control group met the criterion for deterioration in symptoms. The current pilot RCT provided a preliminary assessment of the efficacy of MEST relative to both a non-intervention control group and to TF-CBT (PTSD treatment of choice) in the treatment of PTSD symptoms in a group of bereaved war-affected male Afghan adolescents. The results indicated that both MEST and TF-CBT were successful in significantly reducing symptoms of PTSD, with controlled effect sizes for the interventions of 2.37 (MEST) and 2.82 (TF-CBT), relative to no significant change in the control group. These improvements were found to be maintained at 12-week follow-up. MEST and TF-CBT were also found to significantly reduce depression symptoms, with controlled effect sizes for the interventions of 1.27 (MEST) and 1.24 (TF-CBT), relative to no significant change in the control group. These improvements were less at 12-week follow-up. After the sessions, participants generally were happier. It was interesting to note that adolescents were more active in MEST sessions, and they thought that the sessions were like a game. Even outside of the sessions, when they were asked a question, the participants were trying to respond with care. They reported that their memory was better in the course. To our knowledge, this is the first study to examine the impact of MEST on PTSD symptoms and the first to compare MEST with the PTSD treatment of choice. There have been significant advances in understanding the cognitive science of PTSD and depression, but the majority of these insights have yet to be translated into clinical application. Basic research over several decades has provided a strong theoretical foundation for the role of AMS in PTSD and depression (Williams et al., 2007). The current study has tested whether a possible intervention targeting AMS is feasible and can improve symptoms of PTSD compared with both a control group and active comparison. The results are promising and provide robust estimates of the clinical efficacy in reducing PTSD symptoms of this simple stand-alone training programme to a comparable level with that of TF-CBT. The findings suggest that including MEST as an adjunct to TF-CBT or prior to therapy may have beneficial effects on PTSD symptoms. In addition, MEST is likely to be more cost-effective and easily administered than TF-CBT and, hence, more feasible in contexts such as the present one where there are significant health-service constraints. Future research needs to consider whether changes in AMS brought about symptom improvement and whether the findings replicate in other populations, given the specificity of the sample selected. The limitations of the study are the lack of inclusion of an AMS measure. Due to the logistics in conducting this study, it was not possible to include the AMT. Future research using different samples should include this measure. In addition, because this was conceived as a pilot trial, the sample size was correspondingly small. However, the promising effect size estimates reported here suggest that a larger later-phase RCT is now warranted. We deliberately focused on participants with high levels of PTSD and depressive symptoms rather than on a particular diagnosis. This is consistent with the other MEST studies and reflects reduced AMS being a transdiagnostic marker across a range of diagnoses (Williams et al., 2007). Future studies could examine the effects of MEST as they pertain to different diagnostic categories. In sum, the findings support MEST as an active training intervention that can successfully improve PTSD symptoms to a level comparable with TF-CBT and with such improvements being maintained at 12-week follow-up. Ahmadi S. J., Kajbaf M. B., Neshat Doost H. T. (2012). Specific recall training versus psychological debriefing, writing for recovery and cognitive-behavior therapy: A comparing study of the effects on the symptoms of post traumatic stress disorder (PTSD) and mood of bereaved Afghan adolescents (Ph.D. thesis, not published). Psychology Department, University of Isfahan. Cardozo B. L., Bilukha O. O., Crawford C. A. G. (2004). Mental health, social functioning, and disability in postwar Afghanistan. Journal of the American Medical Association, 292, 575-584. Griffith J. W., Sumner J. A., Debeer E., Raes F., Hermans D. (2012). Current psychometric and methodological issues in the measurement of over general autobiographical memory. Journal of Behaviour Therapy and Experimental Psychiatry, 42, 521-531. Griffith J. W., Sumner J. A., Debeer E., Raes F., Hermans D., Mineka S., Craske M. G. (2009). An item response theory/confirmatory factor analysis of the Autobiographical Memory Test. Memory, 17, 609-623. Kleim B., Ehlers A. (2008). Reduced autobiographical memory specificity predicts depression and posttraumatic stress disorder after recent trauma. Journal of Consulting and Clinical Psychology, 76(2), 231-242. Kuyken W., Dalgleish T. (2011). Over-general autobiographical memory in adolescents at risk for depression. Memory, 19, 241-250. Moradi A. R., Abdi A., Fathi-Ashtiani A., Dalgleish T., Jobson L. (2012). Overgeneral autobiographical memory recollection in Iranian combat veterans with posttraumatic stress disorder. Behaviour Research and Therapy, 50(6), 435-441. Morina N., von Lersner U., Prigerson H. G. (2011). War and bereavement: Consequences for mental and physical distress. PLoS ONE, 6, e22140. Neshat Doost H. T., Dalgleish T., Yule W., Kalantari M., Ahmadi S. J., Dyregrov A., Jobson L. (2013). Enhancing autobiographical memory specificity through cognitive training: An intervention for depression translated from basic science. Clinical Psychological Science, 1(1), 84-92. Neshat Doost H., Nouri N., Molavi H., Kalantari M., Mehrabh H. (2006). Standardization of the Mood and Feeling Questionnaire. Journal of Psychology, 9, 334-351. Neshat Doost H. T., Yule W., Kalantari M., Rezvani S. R., Dyregrov A., Jobson L. (2014). Reduced autobiographical memory specificity in bereaved Afghan adolescents. Memory, 20(6), 700-709. Panter-Brick C., Eggerman M., Gonzalez V., Safdar S. (2009). Violence, suffering, and mental health in Afghanistan: A school-based cross-sectional survey. Lancet, 374(9692), 807-816. doi:10.1016/S0140-6736 (09) 61080-1. Panter-Brick C., Goodman A., Tol W., Eggerman M. (2011). Mental health and childhood adversities: A longitudinal study in Kabul, Afghanistan. Journal of the American Academy of Child and Adolescent Psychiatry, 50, 349-363. Perrin S., Meiser-Stedman R., Smith P. (2005). The Children’s Revised Impact of Event Scale (CRIES): Validity as a screening instrument for PTSD. Behavioural and Cognitive Psychotherapy, 33, 487-498. Raes F., Williams J. M. G., Hermans D. (2009). Reducing cognitive vulnerability to depression: A preliminary investigation of MEmory Specificity Training (MEST) in inpatients with depressive symptomatology. Journal of Behavior Therapy and Experimental Psychiatry, 40, 24-38. Van de Put W. (2002). Addressing mental health in Afghanistan. Lancet, 360, 41-42. Williams J. M. G., Barnhofer T., Crane C., Hermans D., Raes F., Watkins E et al. (2007). Autobiographical memory specificity and emotional disorder. Psychological Bulletin, 133, 122-148. Williams J. M. G., Teasdale J. D., Segal Z. V., Soulsby J. (2000). Mindfulness-based cognitive therapy reduces overgeneral memory in formerly depressed patients. Journal of Abnormal Psychology, 109, 150-155. Williams J. M. G., Broadbent T. K. (1986). Autobiographical memory in suicide attempters. Journal of Abnormal Psychology, 95, 144-149. Yeung C. A., Dalgleish T., Golden A., Schartau P. (2006). Reduced specificity of autobiographical memories following a negative mood induction. Behaviour Research and Therapy, 44, 1481-1490.